Estacão de Luz - there aren't a whole lot old buildings in SP. Actually, most of it is modern and, well, ugly. But this train station provided us some shelter from a downpour. In Anthony Bourdain’s episode on São Paulo he mentions that the city feels as if Los Angeles threw up on New York. A rather crude description but pretty accurate as well. 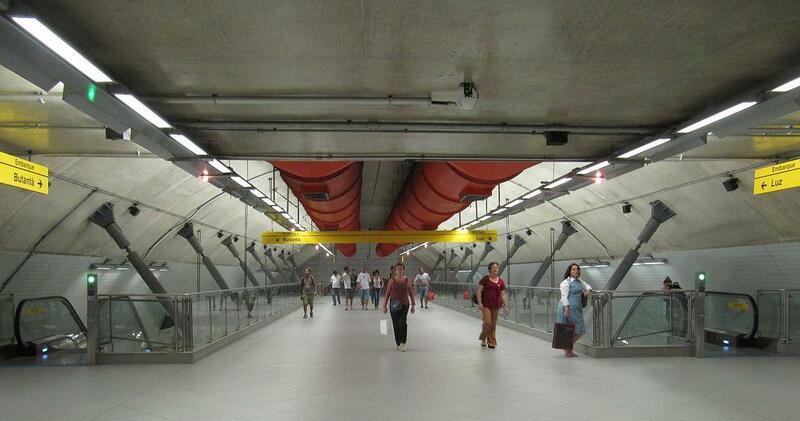 Like NYC, SP has a great subway system, a huge population (20 million people in the metro area! 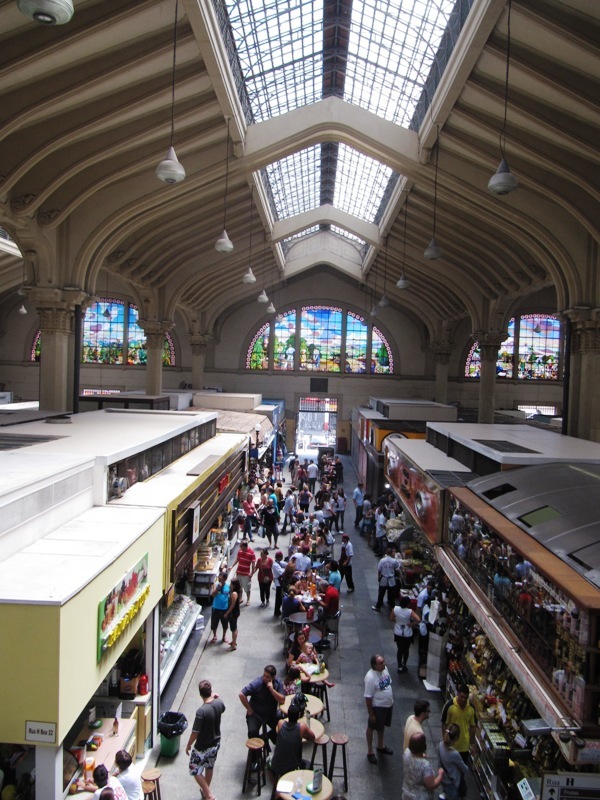 ), more than a few skyscrapers and a wide variety of cultural activities. Like LA, SP is a sprawling city laced with numerous choked up freeways. Since it’s so spread out it’s not a city to wander around by foot. It really helps if you have a friend who lives there and can show you around. Alas, Nathan and I didn’t have a friend living in SP so we explored on our own. Slowly, the city grew on us. Especially as we sampled some of its culinary offerings. Our first day in the city we wandered around the farmers market. 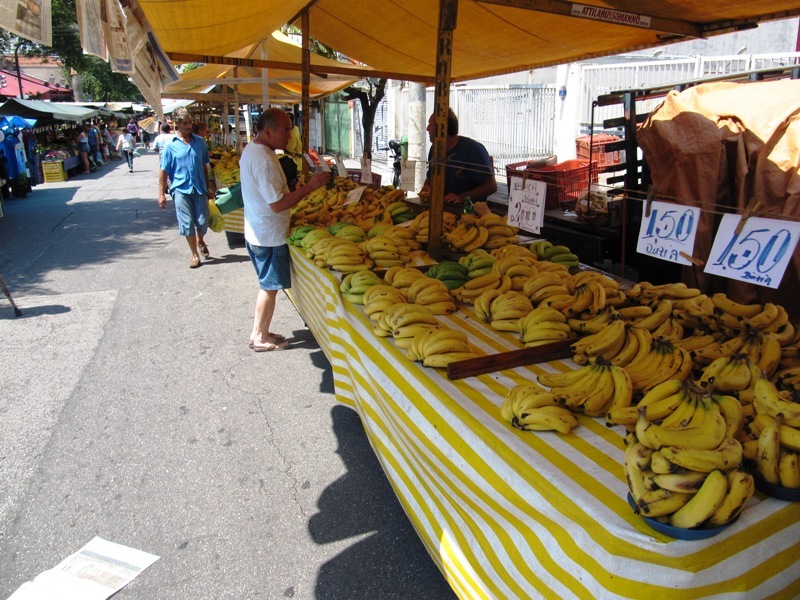 Being Brazil, the tropical fruits are bountiful and the banana stand in particular was huge. But almost anything you could want was there. I have to admit that I missed having my own kitchen to cook all the succulent ingredients. 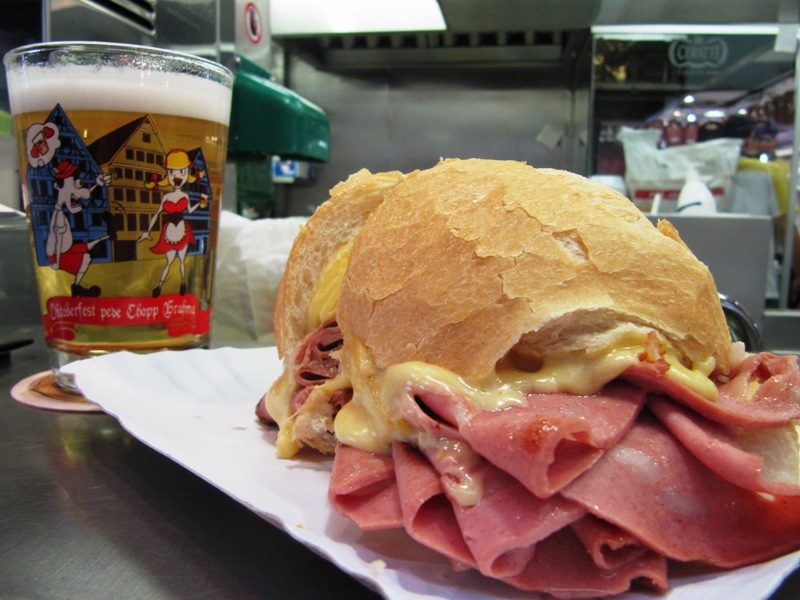 Later in the trip we stopped at the municipal market to pick up a SP classic, the mortadella. We chose the stand with the most people and scooted up to the counter. A mortadella is basically a simple bun piled high with warm, thin sliced bologna. Cheese and mustard completed the sandwich. Pretty awesome paired with a beer, but I was missing some potato chips to go with it. It rained everyday in SP so to beat the chill we were craving some soup. Luckily for us, SP has a large Japanese population. 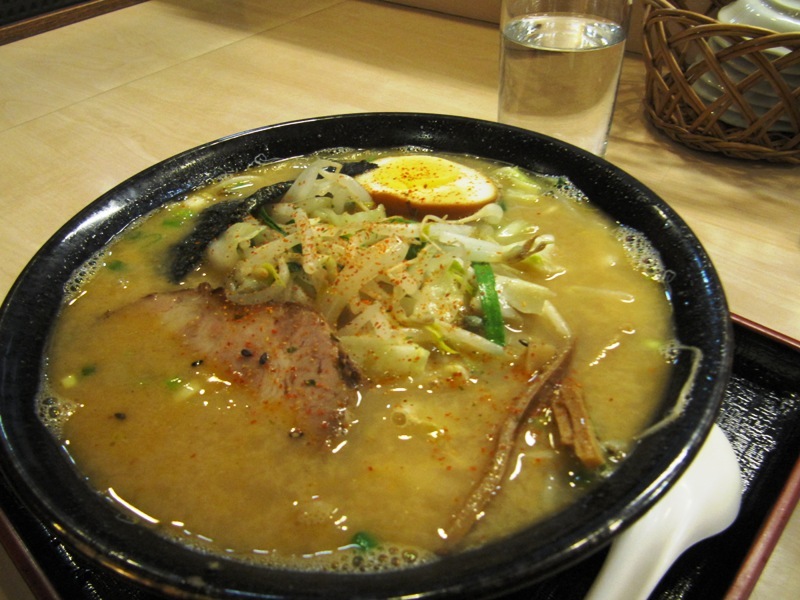 In Liberdade, essentially the Japantown, we popped into Aksa and ordered a steaming bowl of ramen. Oh so comforting. 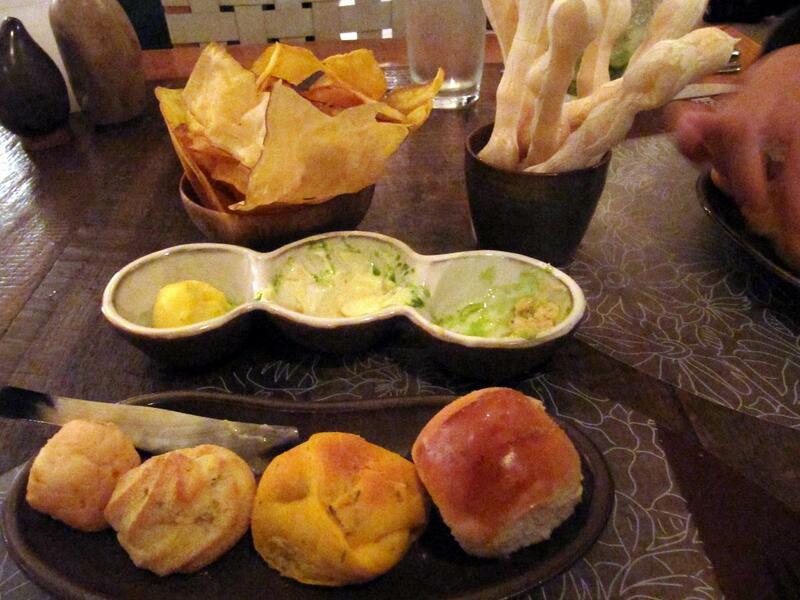 At Brasil a Gosto you get three types of butter, three types of potatoes and four types of bread! Our last night in SP we decided to splurge a bit. 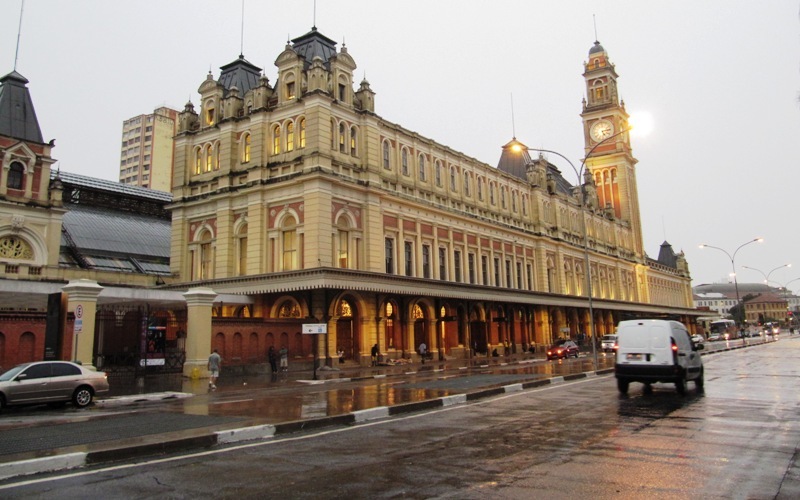 Everyone mentions Brasil a Gosto as the place to eat nouveau brazilian cuisine. This means it takes traditional ingredients but prepares them in new ways. For example, I had pork smothered with an amazonian berry sauce accompanied with creamed mantioc and lightly fried bananas. (Sorry, the picture came out too dark to post.) The food and service were superb but borderline pretentious – the menu was a full on book! But overall I’d recommend it because it was unlike any food I have had before. 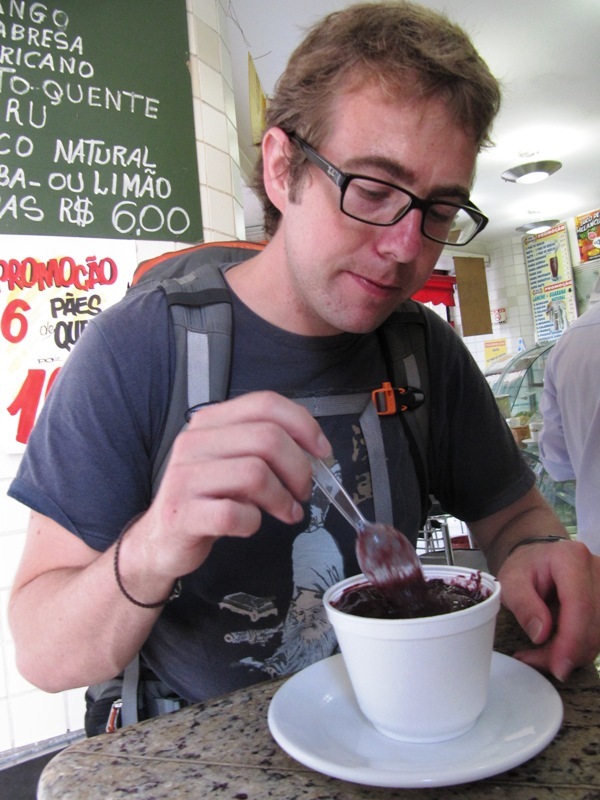 As we headed out of town we couldn’t help but grab one more bowl of açaí. Nathan could not get enough of the sweet and earthy flavors. And then we were on our way to Iguazu Falls!